This is No. 20 in the series. Please read my introduction and explanation here. John 17:11 And I am no longer in the world, but they are in the world, and I am coming to you. Holy Father, keep them in your name, which you have given me, that they may be one, even as we are one. It is truly dissonant to move directly from thoughts of the great God of the universe as Holy Father, to thoughts of a fallen human being as the same…a mere mortal whose proper title is properly God’s Name. It startles the sensibilities. If there were nothing else improper or dishonoring to God in the Catholic Church’s teaching and practice regarding the pope, that he is called Holy Father is enough reason, for me, to reject his authority. But there is. 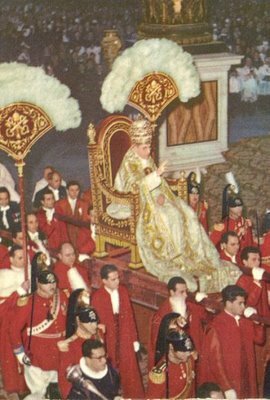 The elevation and exaltation of the papacy in assigning the pope universal power and honor, with great pomp and pageantry, divert praise and exaltation away from God, and are completely contrary to Jesus’ example of humility and his instructions to his apostles not to follow the lead of the Pharisees and exalt themselves. As beloved and humble as the current pope may be, he assumes the titles and power given him by the Church, and receives the praise and adulation given by her people. An audience with the pope involves a whole list of items of protocol, I’m sure. Among them is the expectation that the visitor will bow or kneel before the pope and kiss his ring. Would Peter, whom the Church looks to as the first pope, have allowed anyone to prostrate themselves before him this way? In Acts 10 we have the story of God calling Peter to go share the gospel with a Roman centurion named Cornelius, who was expecting him because of a vision he received in answer to his prayers. When Peter arrives, Cornelius “fell down at his feet and worshiped him.” The Greek word translated “worshiped” is proskuneō and means “to kiss, like a dog licking his master’s hand; to fawn or crouch to, that is, (literally or figuratively) prostrate oneself in homage (do reverence to, adore): – worship.” And how does Peter respond to this treatment? “But Peter lifted him up, saying, ‘Stand up; I too am a man.’” He would not receive such adoration. But every one of his ‘successors’ has and does. Much has been made of Pope Francis’ more humble choices in living quarters, automobiles, and garments, as compared to his predecessors. That this is admirable only serves to highlight the material excesses that are typical of the papacy. Silk finery, Prada shoes, jeweled headgear, ornate palaces, being carried around on a throne so that his flock can catch a glimpse of him. All more befitting of a king than a shepherd. One simply cannot extrapolate such excessive and far-reaching power and authority, nor justify the material trappings of a worldly king, from the witness of the New Testament documents. Only time and “the desires of the flesh and the desires of the eyes and pride of life”4 can account for it.